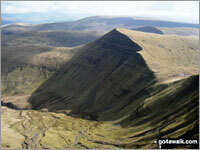 Trust the experts - these are the The Brecon Beacons walks you really cannot afford to miss! If you want to walk in The Brecon Beacons and are looking for some inspiration - here is a list of the very best 14 walks - the walks no self-respecting fell walker should miss. Indeed, The Brecon Beacons offers a huge choice of walks - with a walk to suit just about everybody - from high mountain passes to secluded valleys; from tumbling waterfalls to stunning vistas; from gentle ascents and descents to scrambling on-all-fours along airy ridges with a steep drop on either side. In fact, the area offers so much choice that deciding where to go can be daunting. In any event, all these Brecon Beacons walks, routes and maps will take you to the vantage points offering the very best views in The Brecon Beacons - so go on a nice day if you can. The Brecon Beacons walks any self-respecting walker should not miss . . .
Ridge walks with views to cleanse the soul . . . Pen y Fan, Fan Brycheiniog, Cribyn, Fan y Big, Fan Frynych, Fan Llia . . .
Waun Fach, Twmpa (Lord Hereford's Knob), Black Mountain . . .
Never miss a tick in The Brecon Beacons . . .
Or simply enter a walk, route, map or location name into our Search facility or surf one of our unique interactive walk selection maps covering The Brecon Beacons National Park.